Hi! You look so cute and office chic! 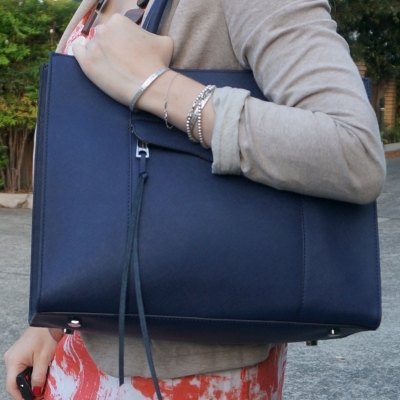 Adore the bag and it compliments beautifully! I pray you are having a beautiful week! I love the first outfit so much, the colours look amazing together and I love the addition of the yellow necklace, so pretty! The first outfit is definitely my favorite - I love the blue and yellow combo! It's nice to switch things up sometimes - I'm actually the opposite in that I almost never wear heels and rarely ever have. I'm glad I still have a few pairs, but I don't see them as essential as I did pre-knee injury and before kids, haha! Both of these outfits are fantastic! 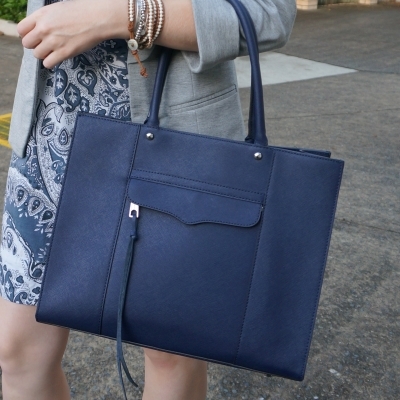 The blazer adds just the right professional touch to the dresses, as does your gorgeous structured bag. Blazers are awesome for making something look more professional! I always love putting on dresses, because they look great!! And I think varying our shoe height can be good for us!! I try to wear heels a couple days a week and flats the rest!! Yes it's good to mix things up a little! I hardly ever wear heels anymore either. I have to tell you I'm super impressed how you change your handbag out. I have been using the same handbag for a year now. Haha thanks! I need to justify having all those handbags somehow, and swapping bags out is a good way to do that! That tote bag is adorable. I love the color of it. I love the prints of both of these dresses, soooo pretty! Yay for breaking out the heels for a bit! I used to wear them to work every day too but now since I work from home I don't need any shoes, haha!! I love these color combos Mica! 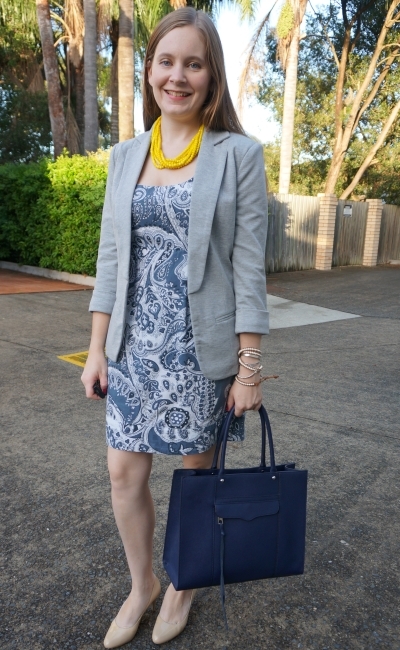 That yellow necklace is perfect with the blue print dress, and I LOVE the navy bag with the orange print as well. I rarely wear heels these days but every now and then it's nice to feel a little more dressed up and wear them (and cross my fingers I won't have to do much walking!). haha yes, I only wear them on low amounts of walking days! Both are fabulous looks, Mica! That yellow necklace really makes the first outfit! I've been gradually lowering my heel height on my shoes over the years, and try not to wear my really high ones for a full day. Your feet will thank you in 20+ years! Yes, I have a super high pair I haven't worn in years, these are much more manageable! How great you wear able again to wear heels, dear Mica! And I like also that you discovered you didn't wear the first dress never before with the amazing yellow necklace. Also the second look is really my taste. Yes, I'm surprised I hadn't worn them together before, it's a nice combo! This tote is SUCH a jam- super functional and chic! Hope you're having a great week, babe! I love both these French Connection dresses:) You look so great in them, and the RM bag is such a classic. It really pairs well with that second dress! Hope you're having a lovely day so far! I used to buy so much workwear there, they have great dresses! JUST love that first outfit. I really love neon yellow/bright yellows and the blue is so pretty with it. I have been wearing a lot more flats and sometimes will only pull my heels out for blog photos... I do still love heels for a date or girls night out. I love the colors in the second outfit, too. 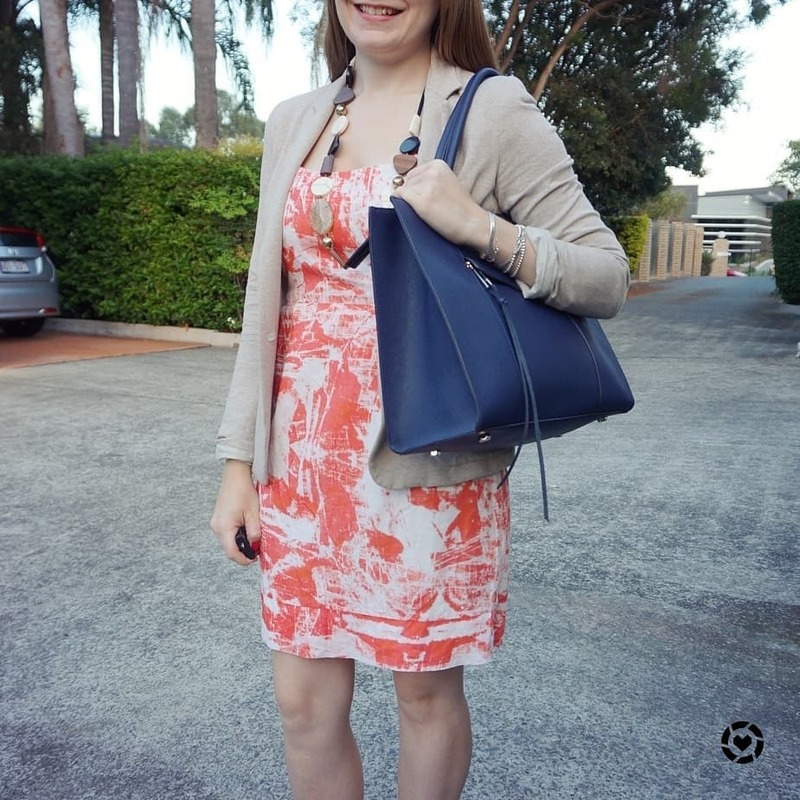 The neutral blazer goes great with the melon colored dress! Yes heels are great for a special occasion or feeling a bit more dressed up! :) Even if I don't wear them often I like having them. These outfits are both so beautiful! And come to think of it, it's been awhile since I've worn heels too. Haha. Will have to break some out! It's fun to change it up every once in awhile. I just love your tote as well! Yes I rarely wear them, but it's good to get them out now and then! Fantastic outfit, so nice and interesting! Love it! You look so effortlessly stylish and beautiful. Love the vibrant necklace a lot. Classic bag! When I was fatter I couldn't wear high heels, now that I'm thin I just want to wear heels, I feel so good and so elegant that I don't want anything else ahahah. But you're perfect with those flats. And in the first look I have to tell you wowow. Now that our weather is warming up, I am loving your office looks! I can finally get away without wearing tights, but I still like to look professional for meetings. These are great inspiration for me! I am a big fan of the blue and yellow! hehe, I'll be considering getting my heels out soon! Love both of these workwear looks! The classic blazer and printed dress is such a chic combo. Love both dresses on you but I adore the blue one more because well, I am a huge fan of blues. I miss having a blazer but I don't work in office anymore so I have no use of it now. I need to wear my blazers more with jeans, they look great that way! I really like both outfits. I think dresses paired with blazer are always a feminine and chic choice. This combo is a winning one and I see it as an elegant version of 'go to' outfits because it is appropriate for most meetings and special occasions. The heels in the first outfit are really cute, but since you had a knee injury I understand why you opt for flats most of the time. Heels are very hard on our knees so it best to be careful. Another thing I love about the first outfit is the pop of colour with the yellow necklace. It looks so pretty and it draws the eye. 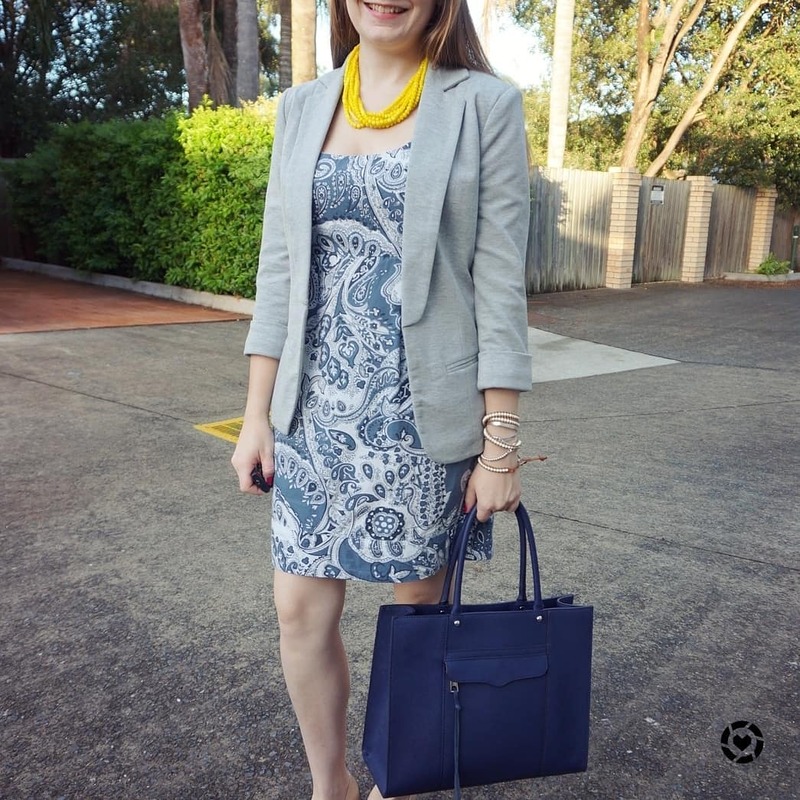 In addition, I love the combo of a blue dress and a grey blazer. Absolutely perfect! I just love your Rebecca Minkoff tote! It's so perfect and functional! I think you look great in either outfits. I hardly wear heels daily in office, but I do wear them a few times a week when I don't work from home. I am already tall so it doesn't bother me. Love this inspiration. I hope you have a great rest of the week. I was away for work but I am finally back from a blog break. I so love that orangy shade in the last dress. The color is gorgeous on you and it's a fun color for warmer weather! I love the colour of the tote bag! You styled it so well! Heels can be really dangerous, my friend is a dancer and she had so many problems because she has to dance in high heels so when she doesn't have to do that she'll go for sneakers or other flat shoes. The bag is so pretty! Yes, I definitely can't wear them all the time any more, I almost always pick flats! Mica, that tote in the larger version is AMAZING! OMG! I think I might have fallen in love with it. How pretty is the navy? I always liked our mini ones, but I may just need to look up the larger one now I've seen how chic it looks! LOVE IT! I love both dresses and jackets Mica. Both looks are so pretty :D Very soft. It's hard going back to heels when you've been comfy in flats. LOL You look great. I used to wear heels so much, but these days I live in flats. I don't even wear them to the office anymore, as I go there by bike with my son on the back and want to wear flats for that. Oh yes, heels are definitely not for riding a bike in! I seriously love both looks! You always seem to make fun dresses look super work-appropriate! I wear heels at least twice a week so I do not forget how to walk in them. That's a good idea! It's tricky getting back into them after a long gap of not wearing them! Such a cute and chic look dear! Love the dress, really perfect with the blazer. I used to do heels for work all the time too and after pregnancy never got back into the habit! I've got a pair for interviews that I'll swap into just before I reach the building, then swap back haha. These are both beautiful sheath dresses! Such pretty colors and patterns! I enjoyed seeing them styled with blazers. You have great professional style, Mica. Thanks for linking up with Fabulous Friday!